*The CACTE Excellence Awards Program seeks to promote excellence in career and technical education by recognizing individuals who have made significant contributions to the field of career and technical education, programs which exemplify the highest standards, and organizations which have conducted activities to help promote and expand career and technical education programs. *Awards nominations must be submitted by CACTE members in good standing. *Candidates for CACTE Excellence Awards may nominate themselves or be nominated by a third party, with the exception of Hall of Fame. HOF nominations must come from a third party. *If your division presented awards, please submit the nomination for consideration by CACTE! All nominations must be submitted online via the CACTE Awards Portal by June 12. CACTE Awards eligible to move on: awards where the state winner moves on for consideration at the Region V level. These awards are eligible for CACTE, Region V and ACTE level consideration and must be submitted online by June 12 via the Colorado ACTE Awards Portal . It’s a bit confusing, but you will be completing the appropriate application labeled 2021! Yes, it really is for the 2019 CACTE Excellence Awards. Colorado winners then go on to the Region V selection committee for 2020. If the Region V winner is selected as the ACTE winner, that award is presented at the 2020 ACTE Vision conference as the 2021 winner. Really, that’s how it works! 🙂 Click on the award name to see specific guidelines from ACTE. ACTE Teacher of the Year (CACTE/Region V/ACTE) – This award recognizes the finest career and technical teachers at the middle/secondary school level who have demonstrated innovation in the classroom, commitment to their students and dedication to the improvement of CTE in their institutions and communities. ACTE Postsecondary Teacher of the Year (CACTE/Region V/ACTE) –This award recognizes the finest career and technical teachers at the postsecondary level who have demonstrated innovation in the classroom, commitment to their students and dedication to the improvement of CTE in their institutions and communities. This award recognizes new CTE teachers who have made significant contributions toward innovative and unique career and technical education programs and shown a professional commitment early in their careers. ACTE Administrator of the Year (CACTE/Region V/ACTE) –This award recognizes administrative CTE professionals at the school, district, county, state or federal level who have demonstrated leadership in ensuring teacher and student success and have made significant contributions toward innovative, unique and effective career and technical education programs. ACTE Career Guidance Award (CACTE/Region V/ACTE) –This award recognizes school counselors and career development professionals who have demonstrated commitment to connecting students with opportunities for success, shown innovation in career exploration and development, and have advocated for CTE as a viable option for all students. ACTE Teacher Educator of the Year (CACTE/Region V/ACTE) –This award recognizes teacher educators who have demonstrated innovation in teacher education, leadership in improving CTE, and commitment to preparing teachers to deliver high quality CTE programs. This award recognizes individuals who have used CTE to make a significant impact on their community and demonstrated leadership in programs and activities that promote student involvement in community service. ACTE Lifetime Achievement Award (CACTE/Region V/ACTE) – This award recognizes CTE professionals for their leadership on behalf of ACTE, their innovations in CTE and their contributions to the field over an extended period of time. 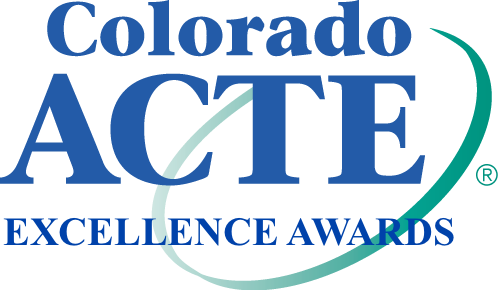 These awards are “Colorado ACTE Only” awards and must be submitted online by June 12 via the Colorado ACTE Awards Portal. This award recognizes an outstanding CTE secondary student who has demonstrated leadership, growth, innovation, and accomplishment in knowledge, technical skills and career preparedness. This award recognizes an outstanding CTE postsecondary student who has demonstrated leadership, growth, innovation, and accomplishment in knowledge, technical skills and career readiness. This award recognizes an Exemplary CTE Alumni who illustrates the mission of CTE; who has made significant strides and shown professional commitment/promise early in his/her career. The person attributes at least some of his/her success to completion of a secondary and/or postsecondary CTE program and/or participation in a CTSO. This award recognizes an individual CACTE member who has made a significant impact on and numerous contributions to career and technical education through active involvement in the professional organization of the Colorado Association for Career and Technical Education and its affiliates. The CACTE Hall of Fame Award is an honor bestowed upon those who have dedicated their lives to seeing the growth and success of Career and Technical Education in Colorado. Persons in this category are those who have both history and vision for CTE and have made extraordinary contributions to the field. They were/are involved in all aspects of the profession from CTSO to professional organization and their legacy will continue far beyond their exit from the profession.